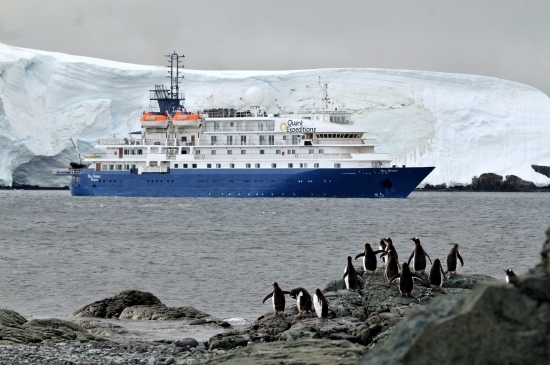 Quark Expeditions specializes in expedition cruising to the Arctic, Antarctica and the Galapagos Islands. Their chartered fleet consists of polar adventure ships and ice breakers. Their employees have combined a spirit of adventure with a deep sense of environmental responsibility and a strong desire to educate others about the wonders of their unique destinations. Quark Expeditions’ first voyage was the Transpolar Bridge Cruise in July 1991 in Russia, sailing across the top of the world and the North Pole. Today they operate eight expedition ships equipped with Zodiacs for shore transfers and ocean-level cruising. Their ships also act as platforms for optional sea-kayaking, camping, mountaineering and cross-country skiing. None of their vessels carry more than 199 travelers. Quark’s Expedition Team members have a unique set of skills. Some are experts in polar history, marine biology and glaciology. All are experienced and understand the rigors of expedition travel. The Captains and their officers and crews are skilled at navigating through pack ice under extreme conditions. The Hospitality Teams prepare meals and pour beverages during gale force winds. Cruise Management International (CMI) and CMI Leisure have the contract for technical and marine operations as well as hotel operations for the vessels, Ocean Diamond, Ocean Endeavor, Ocean Nova, and Sea Adventurer. Alternatively, the vessel, Evolution, is owned and commercially managed by Quasar Expeditions.